Chiara Lorenzetti, restorer, artistically born in 1991. After attending the Istituto per l’Arte e il Restauro “Palazzo Spinelli” in Florence, I set up my shop, Chiarartè, in Biella, in the historic antique shop of my father, in Via Cernaia. I mostly work with ceramics, with conservative and aestethical restorations. A special attention is paid on the restoration of biscuits, papier-mache, composite and wax dolls, in cooperation with important collectors and period toys shops. A few years later, the passion for art and knowledge made me attend a course in gold platin on wood, in Florence, an experience resulting in the restoration of polychrome and gilded wooden objects, statues and frames. I started an active cooperation with restorers of paintings and woodworkers, in order to handle complex and comprehensive restorations, supplying a complete service to the client. Two years ago, after my father closed his workshop, I moved to Via Novellino 16, in Biella Chiavazza, a small and bright workshop where I continue my business, supporting it through my website and social networks, Facebook first of all. With my online presence, I created a strong reputation; I follow and cooperate in many groups of ceramists and collectors of ceramics and dolls. 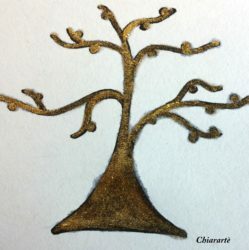 On my personal blog, Squarci di silenzio, I write about art and on the blog of Biella’s Rete al Femminile about craftmanship, cooperating with other bloggers. In 2007 I received the Eccellenza Artigiana, award issued by the Piedmont Region. 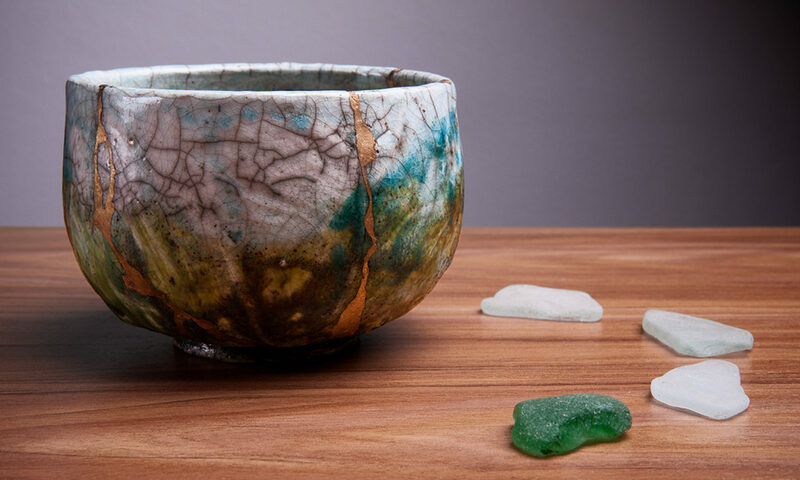 With the aim of continuous research, as incentive for my business, I started to study the ancient Japanese Kintsugi technique, which reapairs fractures in ceramic with gold; from the very beginning I used local urushi laquer, tomoko and gold dust, until I reached the complete mastery, discarding the idea of using epoxy resin and glitter, as commonly done in western countries. At present, I am one of the few restorers in Europe using the original Japanese Kintsugi technique, a technique which is currently little used even in Japan. I wrote the manual “Kintsugi, l’arte di riparare con l’oro” (Kintsugi, the art of repairing with gold), where I outline the historical period in which the Kintsugi art was born, the cultural and artistical context, the technique itself, it’s implementation and the Zen philosophy. 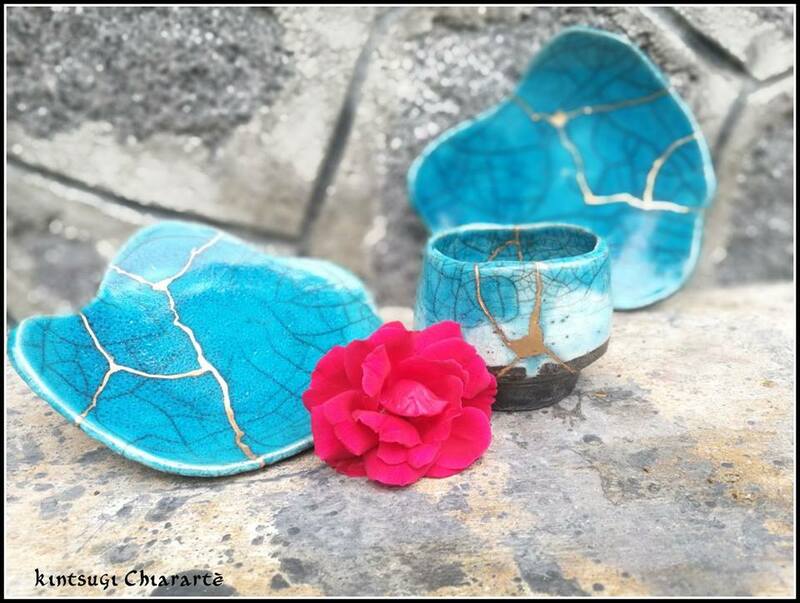 I practice the Kintsugi art both on client owned pieces and on ceramics made by ceramic artists; I created the series “Imperfetti”: as artist and restorer, I break small pieces with baking defects, which the ceramists discard, in order to repair them with urushi lacquer and gold dust. I’m teaching a few classes. An experience-based workshop focusing on manual and spiritual art, “Kintsugi, l’arte di valorizzare le crepe della vita” (Kintsugi, the art of enhancing fractures in life), in cooperation with the psychlogist Stefania Macchieraldo, in which one works with a simplified Kintsugi technique on ceramics and on oneself and one’s wounds with the psychodrama. The workshop “Kintsugi, l’arte di riparare con l’oro” (Kintsugi, the art of repairing with gold), a 4 hours workshop to learn the simplified Kintsugi technique with glue and gold dust open to anyone, and the workshop “Kintsugi, l’arte originale giapponese” (Kintsugi, the original Japanese art), for those who have artistic aptitude and manual skills, in which I teach the original Japanese technique with urushi lacquer and gold dust.